Scallops are a food that I have not always had an affinity for. In fact, I used to hate them. When I was a child I remember my mom would make a dish with scallops that I really did not like, but I was always made to finish every last bite. To me, the scallops seemed like fishy bites of rubber. Now, I have heard from most who knew her that my mom was an excellent cook and I’m sure that was true, but I have a feeling she may have overcooked her scallops. Good scallops that have been well prepared should not be tough at all, but instead practically melt in your mouth. This is the recipe that converted me to a scallop lover. It’s very easy to love. The scallops really shine in a simple butter and white wine sauce. Another huge plus is that this meal is so simple, it comes together very quickly. 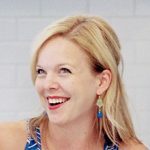 It’s an easy, elegant dinner that would be wonderful for a special occasion, but is also suitable for changing things up from your usual routine on a weeknight. I don’t really make any alterations to the recipe other than not cutting the scallops in half as Ina recommends. They obviously need to cook a little longer this way, but it’s just my personal preference to keep them whole. I served these atop a bed of wilted spinach with our favorite garlic rice pilaf and it was a lovely meal. If using bay scallops, leave them whole. 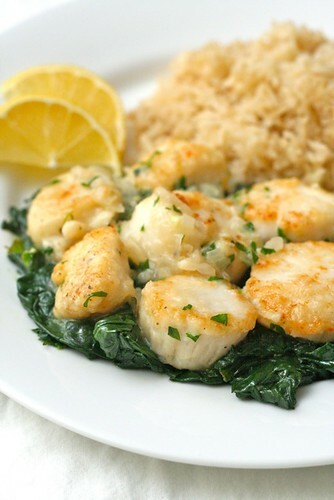 If using sea scallops, cut them in half horizontally (or, leave them whole and cook a bit longer). Season the scallops with kosher salt and black pepper, toss with flour, and shake off the excess. In a large skillet or sauté pan, melt 2 tablespoons of the butter over high heat until sizzling. Add the scallops to the pan in a single layer. Lower the heat to medium and allow the scallops to brown lightly on one side without moving. Then turn and brown lightly on the other side. This should take about 3-4 minutes total (closer to 8 minutes for sea scallops left whole). Add the rest of the butter to the pan with the scallops and let it melt. Add the shallots, garlic, and parsley to the pan and sauté for 2 more minutes, tossing the seasonings with the scallops. Add the wine to the pan and cook for 1 minute. Taste the sauce for seasoning and adjust as necessary. 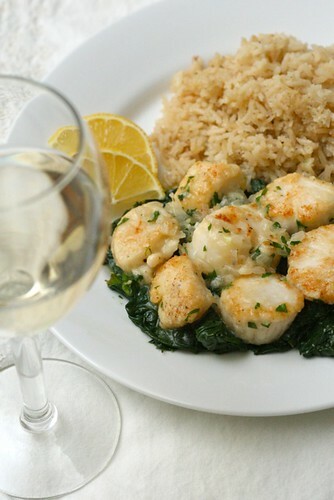 Serve hot, with a squeeze of fresh lemon juice over the scallops.